I’d always fancied a hobby that involved ‘stuff’ and then I started cycling. I did’t realise quite how much ‘stuff’ or more specifically wardrobe you need to cycle comfortably in the UK with our famously changeable and variable weather. Then of course there is what to do with the items you need to take out with you on a ride: phone, money, cards, keys etc. Many people make do with a ziplock bag, tossing everything in to jumble against each other. I didn’t fancy this approach, and since I started riding I’ve been using a Pocpac iPac which has a slot for a card and cash but nowhere for your keys. Now being somebody that enjoys “nice things” and is cursed with the need to find the perfect solution for problems imagined or otherwise, I’d started casting around for a better, and dare I say more elegant way, of carrying my personal effects whilst riding. I was starting to think about the Rapha Essentials Case, but was put off by it not being properly waterproof or truly designed for smartphones. 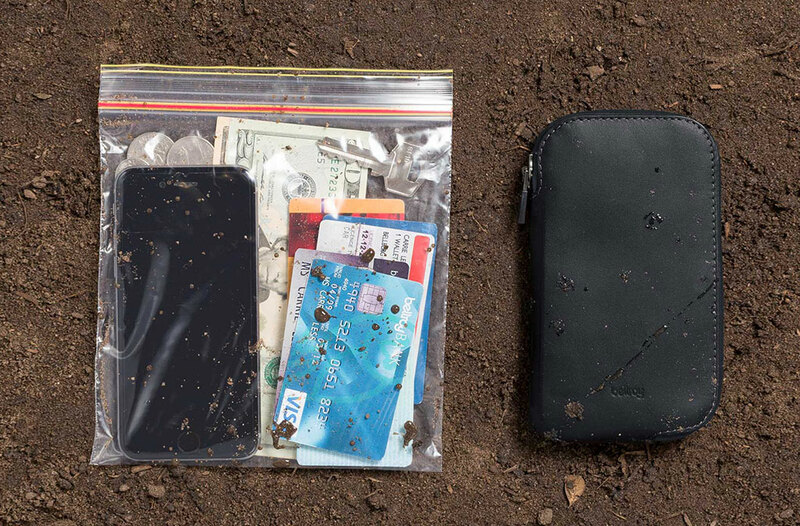 , I follow them on the Social Medias, and just as I was starting to look around Bellroy shared a teaser photo of a new product, what looked like one of their Elements wallets with an iPhone poking out and tagged #comingsoon. 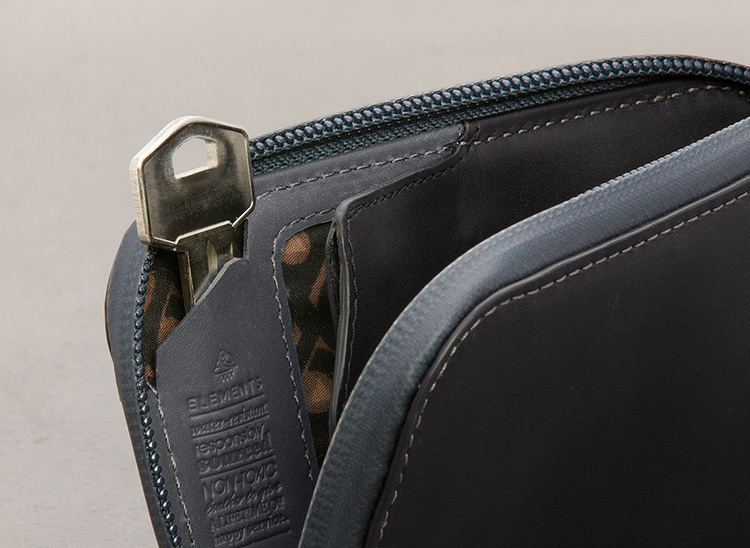 An email to the lovely Karen at Bellroy confirmed it was as I suspected and called the Bellroy Elements Phone Pocket. An offer of one to review was quickly and gratefully accepted, I’ve now used the Elements Phone Pocket a few times and it really is a great way t carry your ‘stuff’ when cycling. I carry an iPhone 5S, a One Life iD card, an “emergency tenner”, my bank card and the key to my garage, the Elements Phone Pocket easily accommodates these and makes each easy to access. Perhaps most importantly the clever and considered design of the Elements Phone Pocket means that whatever you carry cannot rub against and scratch your phone – nice. Within the Elements Phone Pocket there are four slots that can take cards or cash, so capacious and numerous are they that you could easily carry a full wallets worth of cards if you so desired. One of the slots on the outside of the Pocket can accommodate coins which is very handy, as whilst a tenner is easily stashed the change from your coffee stop is less so. I particularly like the special slot for a key, something that could wreck havoc against your phone. The only addition I’d like to see to the Elements Phone Pocket is a pull tab or similar device to make removing your key easier as it can be a little tricky especially with cold fingers. There are also dedicated slots for a SIM card and iPhone SIM removal tool. I initially thought this an odd addition, but as I’m now looking for a new mobile provider that I hope will actually be good enough to allow me to upload photos whilst on a ride and for Garmin Live Track to maintain an internet connection for its entirety I might be testing a few SIMs in the near future. 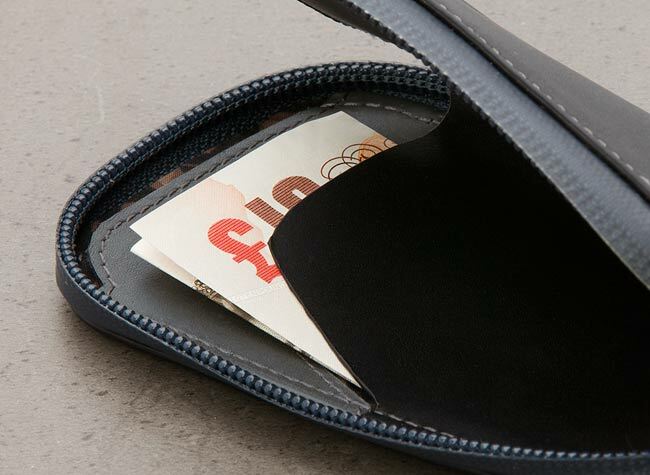 The Elements Phone Pocket is made from what Bellroy call all weather leather, it looks like high quality leather but has a different finish to that of their wallets. 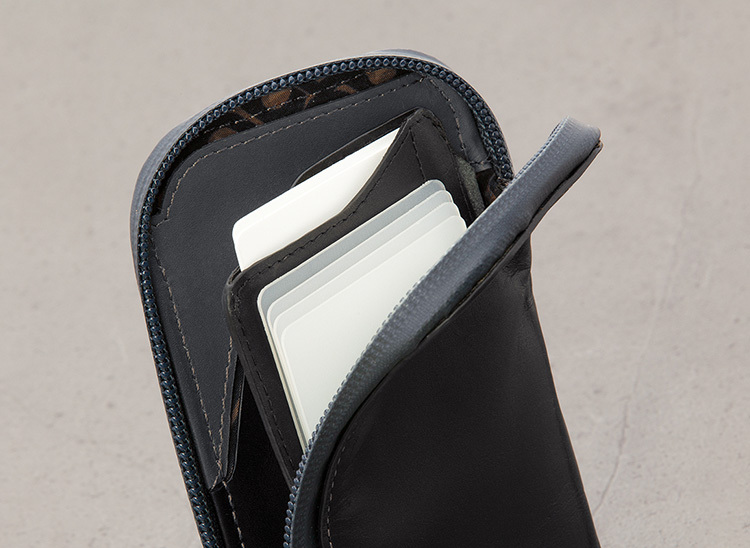 The interior is Bellroy’s usual buttery smooth leather and funky printed cotton. The layers of leather that make up the pockets and slots sit against outside of the wallet with your phone in the middle, this provides a significant degree of padding and protection. I’m pretty sure you cold drop the Elements Phone Pocket from your jersey pocket on a fast decent and your phone would emerge unscathed – now Bellroy make no claims for impact protection and I’ll make it clear I haven’t tested this and advise you not to do so. The zips are water-resistant YKK zips, that have a plastic cover that ‘seals’ as you do the zip up. These are the same as Tom Bihn use on their bags so I have no doubt they will resist all but the most persistent precipitation. The Bellroy Elements Phone Pocket is one of my favourite things. It does what it was designed to do perfectly and cleverly, it’s made from the highest quality materials and in short is a delight to hold and to use. It is the perfect phone wallet for outdoor activities, if you cycle I highly recommend it. 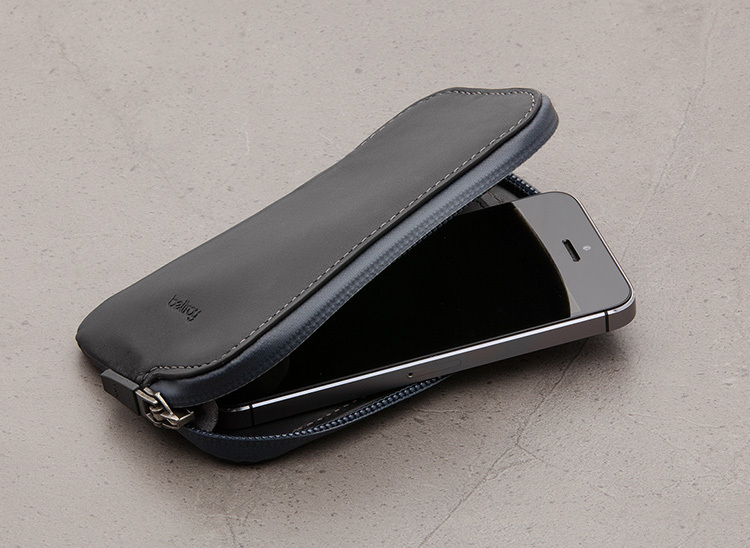 See what I think of the Bellroy Elements Phone Pocket for the iPhone 6S in Bellroy’s new slate colour. Quick question… does the case hinder connection to a Garmin device at all. Obviously the Garmin ‘speaks’ to the phone for certain things like live tracker and weather reports, etc? Would greatly appreciate any feedback if you have. No, not at all. I use a Garmin 810 and have had no issues. Thanks for taking the time to write this review. I am just looking for an iPhone 6 case and being a Bellboy fan their cases have caught my eye. Just a quick question: Does the case fit in your pocket easily, for example a pair of jeans or would it need to be carried? Philip – I carry my 5s version in a pocket in a cycling jersey so would expect no issues in a jeans pocket, notwithstanding the larger size of the 6. I’m always a skeptic when ordering from certain sites, was there any issues when ordering from bellroy, such as hidden charges, non delivery, non response etc…..
@eddie Bellroy are brilliant. Fast shipping and superb customer service.